Prague College offers a range of undergraduate and postgraduate degree programmes all in collaboration with our key academic partner Teesside University from the UK. Our programme specializations and interests stem from our focus on work with industry and our commitment to the individual student experience and the fostering of leadership skills, communication and creativity. Following the British model of education our Bachelor’s degrees are three years in length and our Master’s degrees are from 1 to 2 years in length. 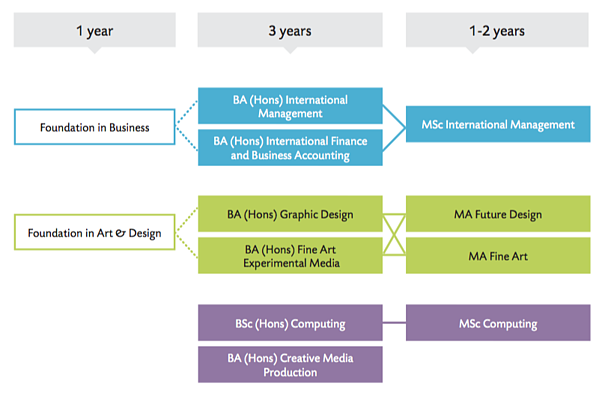 We also offer unique one-year Foundation programmes in Business, and Art & Design as well as a number of professional diplomas and accountancy certifications.